Africa's over-reliance on external institutions is undermining the continent's capacity to strengthen agricultural research and development for improving the livelihoods of millions of people. It is galling that a continent with 60% of the world’s uncultivated arable land, that spends $35bn every year importing food, is still home to the world’s hungriest, most malnourished population. And although irrigation in Africa has the potential to boost productivity by at least 50%, food production on the continent is almost entirely rainfed: the area equipped for irrigation makes up just 6% of the total cultivated area. The world’s population currently sits at 7.3 billion and is predicted to rise to 9.7 billion by 2050. Because of Africa’s increasing population growth, the continent is expected to contribute to more than 50% of the global population growth by 2050. Thus, it is becoming increasingly obvious that Africa must rise to the challenge and start to make better and more efficient use of her resources in a bid to feed herself and the world. Agricultural research has made significant strides in the last century in countries such as the United States, where farm efficiencies, including animal production, have improved. This led to the United States producing a fourfold increase in milk yield per cow between 1944 and 2007, with average maize yields increasing from 1.6 tonnes per hectare in the first third of the 20th century to over 8.5 tonnes in 2009. Organisations such as World Bank have been supporting countries to increase science capacity through the Africa Centres of Excellence project in institutions of higher education located in several countries in sub-Saharan Africa such as Benin, Burkina Faso, Cameroon, Ghana, Kenya, Malawi, Nigeria, Senegal, Togo and Uganda. Africa must rise to the challenge and start to make better and more efficient use of her resources in a bid to feed herself. Such centres can help share knowledge and facilities, and motivate countries to invest and bring about the necessary transformation in science and agriculture in the region. Research conducted by the International Institute of Tropical Agriculture and funded by institutions such as the Bill and Melinda Gates Foundation provides an excellent example of how research improves agriculture. For example, aflatoxin is a cancer-inducing chemical produced by a fungus (Aspergillus flavus) that not only damages human health but is a barrier to trade and economic growth. The toxin, however, is not produced in all strains of the fungus. This project found that introducing nontoxic strains to affected fields overpowered and reduced the population of toxic strains, drastically reducing the rate of contamination. Work with the US Department of Agriculture has resulted in a biocontrol solution called Aflasafe that is now being commercialised and made available to farmers in 14 sub-Saharan countries including Burundi, Malawi, Mali, Zambia and Zimbabwe to help produce food safe for human and animal consumption. Scientists from the International Institute of Tropical Agriculture and several institutions have played a leading role in developing improved cassava varieties that are disease- and pest-resistant, lower in cyanide, drought- resistant, early maturing, and high yielding. As of 2010, investment in research and development in general across African countries ranged from 0.02% of gross domestic products in Madagascar to 0.79% Kenya. Thus, more investment is needed in Africa. Research shows that investing an extra $88bn in agricultural research and development worldwide by 2050 could increase crop yields by 0.4% each year. Increasing the capacity of African universities to conduct agricultural research, and improving adequately supporting agricultural extension organisations can help improve yields. Moreover, capacity building projects should emphasise value-chain research and development. Increased scientific research and consistent government supports are the ingredients needed for the continent to make agriculture productive, competitive, sustainable and inclusive. The architects of agricultural research and education must find ways to make agricultural extension more diverse and less expensive. New skills in science and technology especially in biotechnology, big data management, and information and communication technology are also needed. 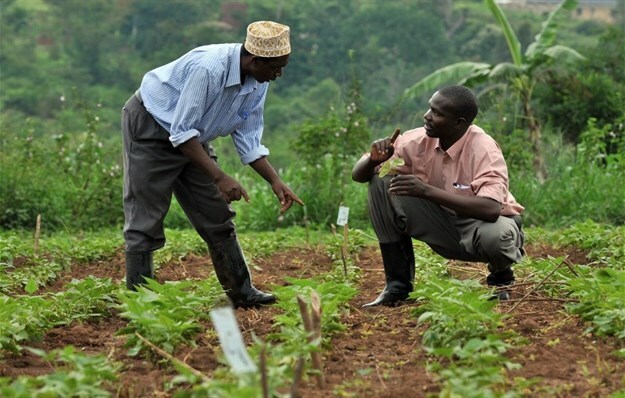 Africa’s development partners must keep faith with the region and governments must mobilise sufficient resources to underpin international investment and ensure a facilitating climate for private sector investment in all forms of agricultural research. Timely research and development is also helping address the continent’s gigantic challenge of youth unemployment. A pilot programme of the International Institute of Tropical Agriculture that aims to engage youth in agriculture start-ups and productive agribusinesses and changing the mindsets of young children towards farming is providing the much-needed impetus to jumpstart development in Africa. With support from the African Development Bank, the programme is being implemented in 24 countries including Kenya, Tanzania, Uganda and Nigeria. These efforts partly contributed to the IITA receiving the 2018 Africa Food Prize. Global food security is no longer the pipe dream it once was, and the reality of an Africa that not only feeds itself, but contributes to feeding the rest of the planet is just over the horizon. Increased scientific research and consistent government supports are the ingredients needed for the continent to make agriculture productive, competitive, sustainable and inclusive. Nteranya Sanginga is the director-director of the International Institute of Tropical Agriculture (IITA).